Saturday was Earth Day, an occasion that usually leaves me lukewarm at best. But this year it was also the day of the worldwide March for Science. A few news stories have quoted environmentalists who resented that the march happened on “their” day. But from my viewpoint, that’s the best day of the year for a science march. The Earth Day community needs the help, and the organizers are upping their game. 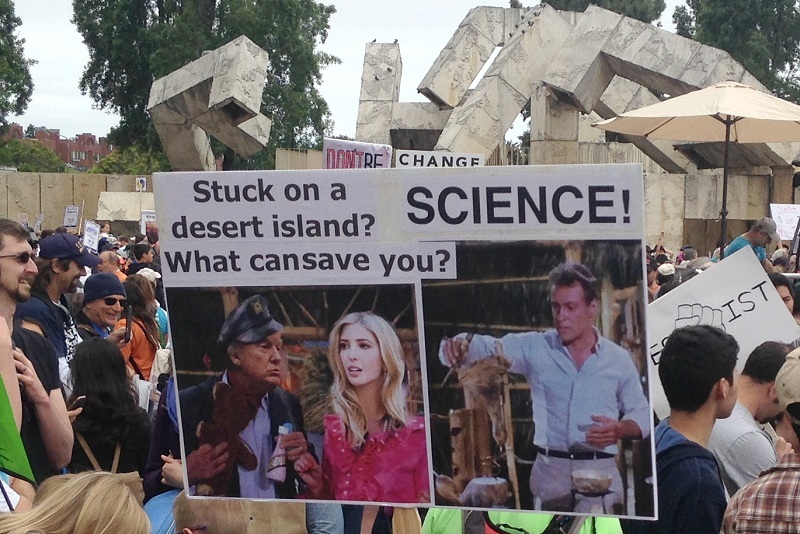 We should have a science march, or at least a rally, every year. This year’s inaugural march had a militant edge. So did the original Earth Day. And for centuries before that, scientific advances have shaken up establishments of all kinds. 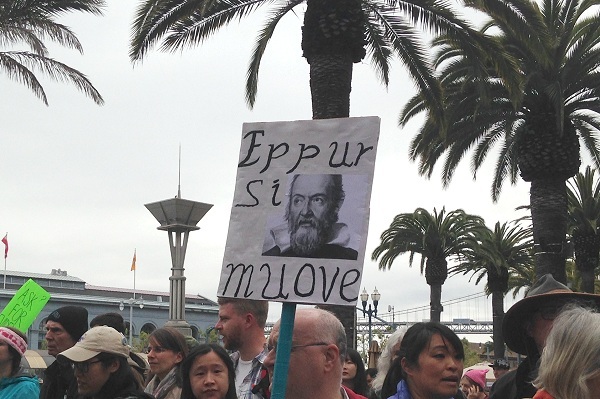 This sign, quoting Galileo’s legendary comment after the Church forced him to renounce his discoveries, was a shout-out to that long history. The authorities can threaten people for their beliefs, but they can’t force facts to be untrue. And when Galileo muttered “Nevertheless it moves,” he was talking about the Earth. Other signs were more contemporary, more pointed . . .
. . . and funnier. 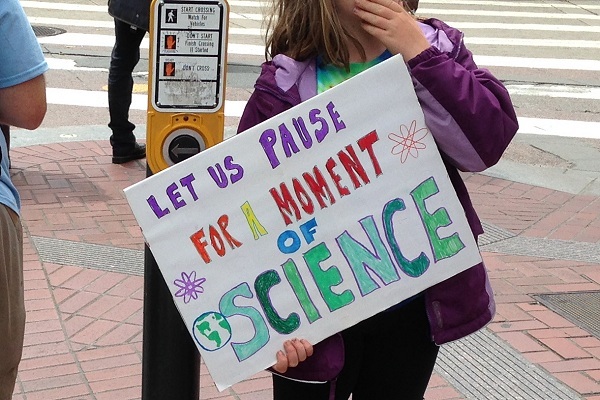 I could have marched with the group from the American Geophysical Union, which endorsed the event. I’ve been an AGU member and rabid fan since the mid-1980s. 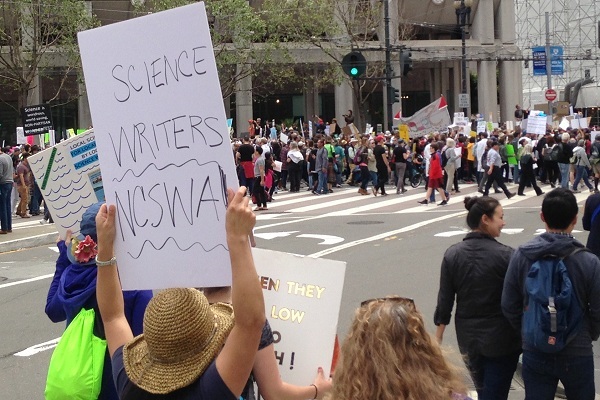 But I chose to walk with the Northern California Science Writers Association, because they represent my practice. Our little group took a side route to the march along Drumm Street, and when we got there Market Street was packed. It took us an hour to stroll to the Civic Center. People lined the route, holding their signs and admiring ours. There was a learning fair at the other end, what we used to call a teach-in. 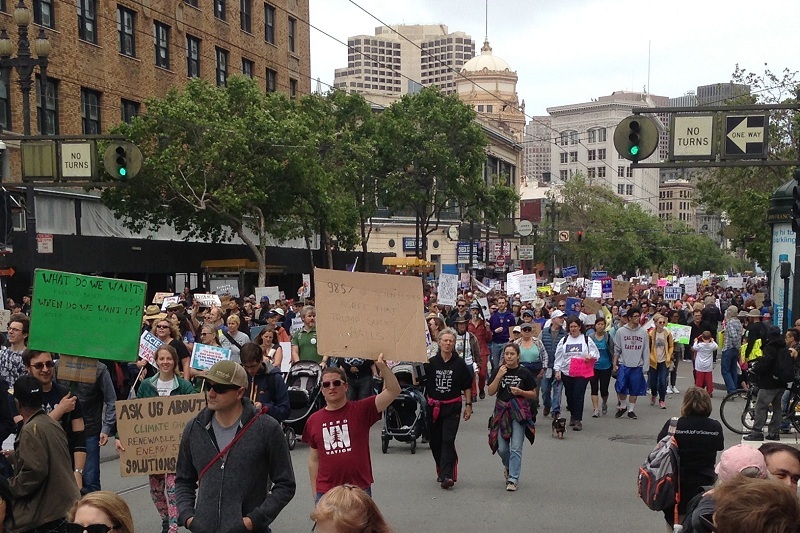 As I prepared to return to Oakland, incoming marchers still filled Market Street to the limits of my sight. This was not a small occasion. There were thousands of signs. This one reminded me of an important truth. It means that the scientific method is simply a more rigorous version of something we all do. When we face a question of any size, whether it’s choosing fruit at the market or investing our life’s savings, we make our best estimate of what to do, check the results against our expectation, and then make adjustments in how to proceed. Science is common sense weaponized, and the better we are at common sense the more we are like scientists. 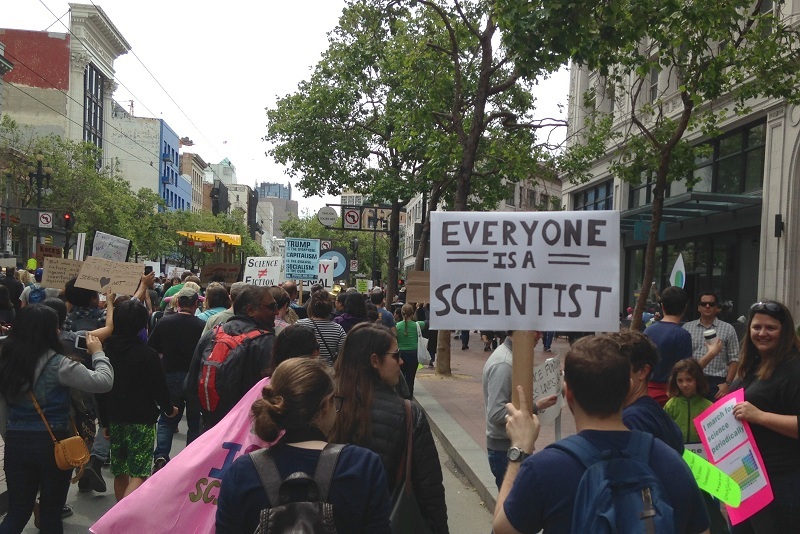 One thing that stood out to me at the San Francisco March for Science was that science has more than practitioners — it has fans. When the speakers at the rally made shout-outs to NASA, they drew widespread cheers. The same for stem-cell researchers at the California Institute for Regenerative Medicine or NIH — cheers. These things deserve their applause, and I cheered them as a fan. Although there were geologists and geology fans in the crowd, we didn’t get a chance to make or hear a cheer of our own on Earth Day. I know, we’re grownups and don’t need the adulation, but what about the kids who are into minerals and fossils? Do they sense there’s a pivotal role for them in extrasolar planetology? In evolution studies? In global sustainability, in climate studies, in remediation of polluted places, in ecology? 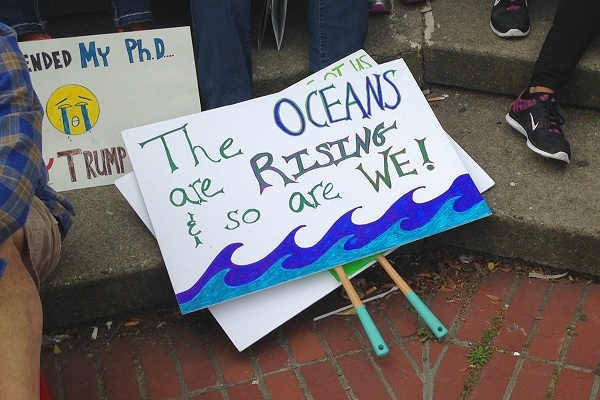 Are geology’s strengths in earthquakes, volcanoes, floods and landslides unworthy of comment in a march for science? Does plate tectonics, with its elegance and grandeur and promise, have no fans among the rally planners? Geologists do tend to keep their heads down. Because Earth science is too wonderful to neglect, I plan to push ahead. You are fans, and I have hundreds more stories for you. This entry was posted on 24 April 2017 at 8:02 am and is filed under Other topics. You can follow any responses to this entry through the RSS 2.0 feed. You can skip to the end and leave a response. Pinging is currently not allowed.